Dogs love peanut butter! I mean they really love peanut butter – if you visit YouTube there are about 263,000 clips of dogs going crazy for peanut butter – some of these clips have been viewed millions of times. This passion can be incredibly useful – especially when your dog has some medicine to take. How many of us have tried to wrap a pill or tablet from the vet in chicken or some other food only to watch as your crafty canine manages to eat around the tablet and then quietly spit it out behind the couch. In these situations peanut butter is your friend. Smothering the tablet in peanut butter (assuming your dog is one of the millions who love it) is a great way to ensure your dog takes his medicine without a fuss. But not all peanut butter is equal. Some manufacturers of peanut butter are now adding xylitol to try and make a lower calorie option. Xylitol is a sweetener found in sweets, desserts and chewing gum as well as many vitamin supplements but it’s extremely toxic to dogs – even in tiny quantities. Ingestion of as little as 0.1 grams of xylitol per kilogram of body weight can cause a rapid and dangerous drop in your dog’s blood sugar (a condition called “hypoglycemia”). The symptoms of hypoglycemia include staggering, appearing disoriented, collapse, weakness, and seizures. Just slightly more than that, approx. 0.5 grams per kilogram of xylitol ingested by your dog can lead to debilitation and destruction of your dog’s liver cells. This can cause death. In truth, the actual toxic doses could be even lower, and dogs with certain pre-existing medical conditions including diabetes or hepatitis are likely to be even more sensitive to xylitol’s toxic effects. Ironically these ‘healthier’ peanut butter varieties are often sold in health food shops because they contain lower calories than traditional peanut butters. 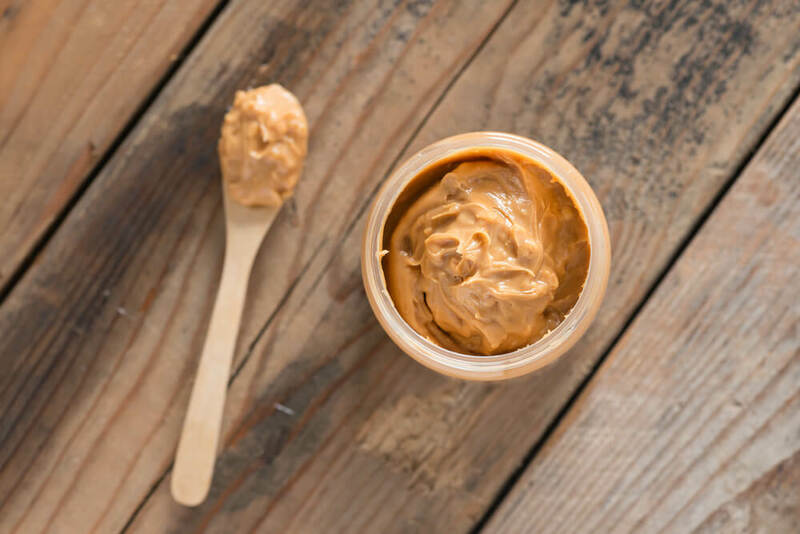 These new style peanut butters may be better for us (although that’s highly debatable) but they are certainly not better for your dog – and most of us just don’t know about it. Ask any dog owner what food is dangerous to dogs and the vast majority will immediately say chocolate. Most of us are already aware that they should never feed their dog chocolate because it’s toxic to dogs. Very few are aware of the dangers of xylitol and yet xylitol is significantly more deadly to dogs than chocolate. Of course, xylitol is not only found in peanut butter or other nut butters it’s becoming ubiquitous in many foods – especially those advertising lower calories. Make a habit of reading ingredient lists and avoid anything that lists xylitol. Pay particular attention if the packaging states, “sweetened naturally” or that the product contains “natural sweetener”. Also avoid products that are labelled “sugar free” or “no sugar added” as this may also indicate that xylitol is lurking inside. If you are unsure – then take a picture of the label using your phone and research it online or ask your vet. And if in doubt, consider making your own nut butter to disguise your dog’s medicine or just as a tasty treat. We’ve put together a great recipe for home-made dog friendly nut butter. You can view it HERE. It’s very easy and very yummy! In the meantime spread the word – let’s make sure that every dog owner is as familiar with the dangers of xylitol as they already are to the dangers of chocolate. And remember even xylitol free peanut butter is chock full of calories so make sure it’s only an occasional treat. Should you boost your dogs immune system?